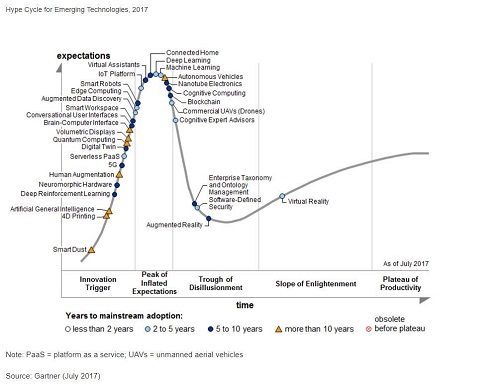 In a report entitled Hype Cycle for Mobile Device Technologies, Gartner discusses the widespread preparation for 5G networks, the Internet of Things (IoT), and machine-to-machine communications. These technologies are preparing to support a worldwide customer base that looks forward to smart cities, autonomous vehicles, and high speed multimedia over broadband anywhere and anytime. And of course, this is not an either/or–it is a continuum. To get everyone on the road to 5G, network visibility and analytics must be able to handle the rising traffic volumes we are seeing today. 5G is being slowly adopted today, and should see widespread in 5 years (Figure 1). 5G adoption in the coming years will bring significant gains for security, scalability, and speed of global cellular networks. And over the next few years, organizations will most often utilize 5G to support IoT communications, high definition video and fixed wireless access. AT&T, NTT DoCoMo, Sprint USA, Telstra, T-Mobile, and Verizon have all announced plans to launch 5G services this year. These operators and others, including KDDI, Softbank, SK Telecom and Korea Telecom (KT) are releasing early specifications so that vendors can supply them with infrastructure such as 5G air interfaces and radio access technologies to accelerate throughput well before the complete standard is released in 2020. To further accelerate rollouts, many operators have are performing open trials to share results and further accelerate rollouts. And what does this imply about the architecture of networks at the mobile edge? Light Reading points out that 5G, IoT and virtualization trends will impact central offices that will often become full data centers adopting “leaf-spine architectures to support high levels of East-West data center traffic” and many more connections than traditional core-aggregation data centers could support. As operators chart the course to 5G and migrate to software-based, virtualized networks, their visibility and analytics infrastructure must follow suit. This is where network packet brokers (NPBs) become critical. Many operators are choosing to have this technology in place just to handle the rising traffic volumes leading up to 5G; those that do will be that much more ready for the next generation. Are subscribers being treated fairly and according to their service level agreements? Are the locations of all subscribers and other connected entities correctly identified? Are subscribers and connected entities associated with the right cell towers? Is all traffic secure and free from intrusion or DDoS attacks? Is video and voice being handled properly, whether the requirements are real-time or asynchronous? Extreme’s Network Visibility Solution (Figure 2) is in use today in numerous Tier 1 service providers in every theatre. In addition to the packet brokering technology itself, the solution is anchored in the Session Director, which includes a Visibility Manager and software-defined session intelligence for scalable, on-demand mobile network visibility (Figure 3). Session Director deals with the setup and tear down of monitoring “sessions” by turning SPANs (switch port analyzers) and TAPs (terminal access points) on and off. It also optimizes the sessions for the analytics tools. Thus, as NPB enables intelligence to be gathered from network, Session Director makes NPB itself more intelligent with more flexible, selective traffic matching, network wide tunneling, and built-in traffic optimizations. This makes the architecture more scalable and cost-effective. 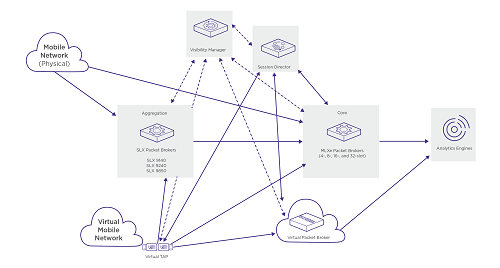 Finally, to achieve the scale and performance needed for 5G and IoT, Extreme has continued on the path of innovation to disaggregate the hardware packet broker by introducing a virtualized packet broker supported by all SLX and MLX platforms.